is now available for download. Go to this post for updates and download links from @AngryBirds – Updated post. 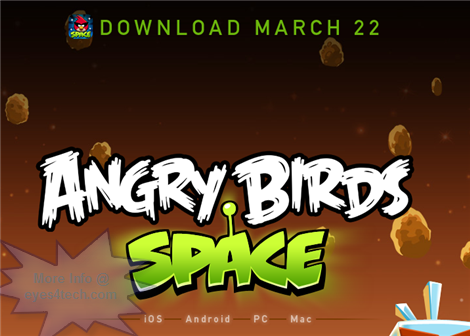 UPDATES 22-MAR-2012: Posted on Angry Birds Space Download For iOS, Android, PC, Mac where @AngryBirds tweets every updates they have and answering queries for the release of Angry Birds Space. If you’re in the mood to stay tune watch every updates from Twitter, just follow this has code #AngryBirdsSpace. Angry Birds Space – it is now official that this game will be released on the 22nd of March for iOS, Android, PC, and Mac platforms. It would be pretty much boring if you keep on playing the same game over and over again, right? Specially if you already know what strategy you should use to win. And I believe that Rovio wanted to address this by providing us all with the same game but with a different face filled with more challenging chapters and stages – that’s Angry Birds Space for you! This is one of the most popular strategy game that started originally on iOS and more specifically with iPhone. The Angry Birds game download grew since then and was distributed eventually on other platforms like Android, PC, and Mac. The company, Rovio, who developed this popular game didn’t stopped by providing us all with just one version since their first release because they are aware that the competition out there is so tight. And so, they have tried to evolved by releasing different versions and special editions of Angry Birds (special editions: Angry Birds Seasons, Angry Birds Rio and now Angry Birds Space). Angry Birds Space game for iPhone, iPad, iPod Touch, Android devices like my Samsung Galaxy S II, PC, and Mac could be another massive hit after the release date. This game will dig deeper into your brain as you have to go back in time and check your “math and physics” capabilities. This will be all about using the correct trajectory to hit those arch enemies of Angry Birds, the pigs, under a “zero-gravity” environment. Well, if you were born lucky then every slingshot wouldn’t be really an issue with you. Here’s the official announcement about Angry Birds Space taken straight from space by Don Pettit from the ISS. He also explained and provided an explanation of how is that “trajectory and gravity” can affect the game. Previous Post Android 4.0 Ice Cream Sandwich Update For Samsung Galaxy S II – False Alarm!